The Twain Shall Meet: Bring on the Tipping Point ~ Declare Harper Land a Failed State ~ The Big Giant head is Top Heavy ~ All Together Now...... Push! 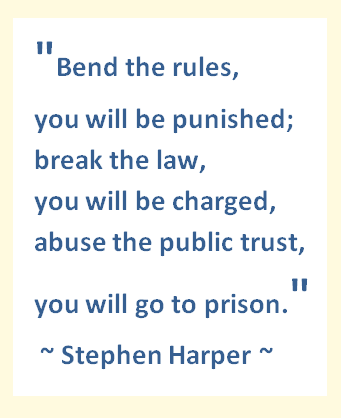 Bring on the Tipping Point ~ Declare Harper Land a Failed State ~ The Big Giant head is Top Heavy ~ All Together Now...... Push! 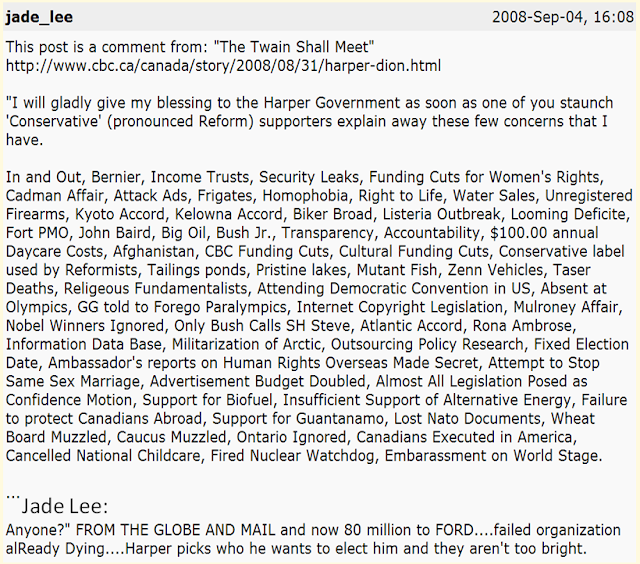 Will we finally take Harper by the short and curlies and throw him to the curb? God knows we have had our opportunities. Some of us thought his infamous speech in 1997 would have made him Disappear. Some thought that the fact that he wanted to take us headlong into the quagmire of Iraq to find those Weapons of mass destruction, might have done it. He even plagiarized a Speech made by John Howard, then the Australian Prime Minister which many say was actually written in Washington. Failing to wake up then, we have continued to ignore countless instances of abuse of privilege, power, bad legislation, constant campaigning and incompetent and backward governance by this so-called leader and his so-called "Harper Government." Here are a few more of those instances, none of which have sufficiently aroused a sense of obligation on the part of Canadians to protect themselves from abuse. This is a copy of a comment that I made way back in 2004, it was reposted then by a stranger on another site, and which still floats around the web these years later. I searched and found it quite easily again today. I will put it up here as an example of the current length of that list. Keep in mind that this one is over three years old and that at the time I wrote it right off the Top of My Head. One can only imagine how long such a list must necessarily be today. This is Pre-Colvin, Pre-Toews, Pre-gazebo, ....... And three and half years before RackNine, Robocalls, and yet another incidence of Election rigging. Three and a half years ago this was ONLY a partial list! And Today, we are really no closer to getting rid of the beast, although some are starting to stir. 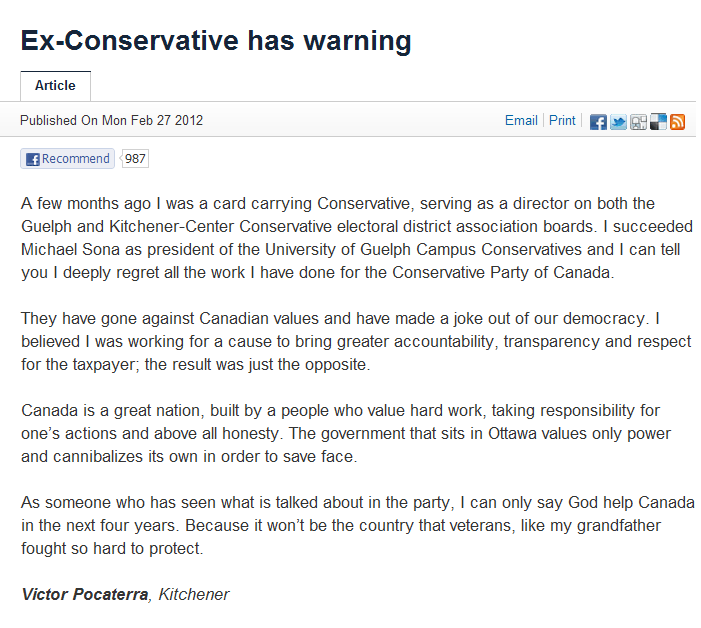 We must remain vigilant, we must continue to apply pressure to the Harper Government. 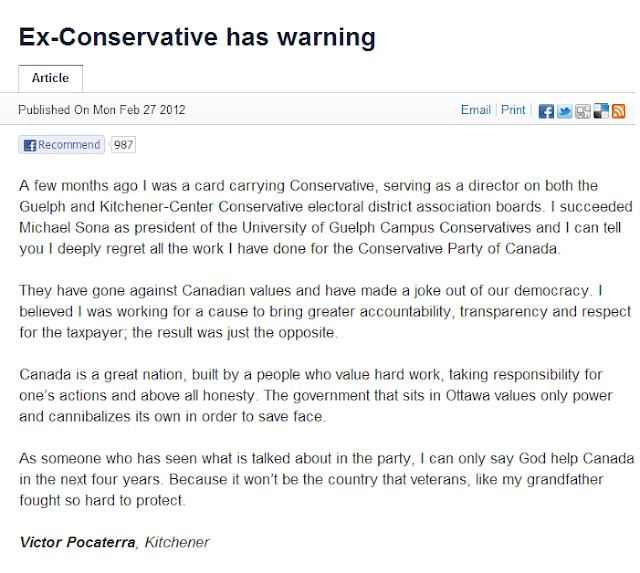 OTTAWA Citizen ~ An Elections Canada investigation into black ops "robocalls" was focused on a Conservative party campaign in Guelph, Ont., documents obtained by Postmedia News and the Ottawa Citizen show. A court order executed on an Edmonton call centre in November specifically refers to records related to the campaign of Conservative candidate Marty Burke in Guelph, where many voters reported receiving pre-recorded messages that falsely claimed their polling stations had moved. Andrew Coyne. "We do not know whether the calls were made by members of the Conservative party. We do not know whether any Conservative authorized them, or even knew about them. We do not know whether anyone was prevented from voting, or had their vote changed, as a result, nor do we know whether the results of any riding were affected. TORONTO - "The opposition politicians were out in force Saturday fanning the flames created by the election robocall scandal, while the Conservatives offered up their own victim of dirty tricks, an MP who won his seat in a landslide. Interim Liberal Leader Bob Rae claims reports of "robocalls" and voter suppression tactics contributed to the defeat of Liberal candidates in at least 27 ridings during the last federal election. These tactics were the equivalent of "stuffing a ballot box," Rae said at a news conference in the riding of Toronto-Danforth on Saturday. Rae called on "the prime minister, any Conservative MP, candidate or party official" who has any knowledge of these reports to come forward and turn the information over to the RCMP or Elections Canada for investigation. Listen to Pierre Poilievre especially closely here. They always dig him up when this sort of Robo- Con message is needed. There is no one in Canada better able to lie stone faced to the camera. During the Contempt hearings and all through the In and out scheme, Poilievre repeated some hundreds of times that it was an "Administrative dispute" and we all know that it was much much more than that. So listen here carefully and remember this statement by Pierre Poilievre, it will not be the last time that you hear it. "It is clear that uh, Voter suppression is completely unacceptable, uh, The Conservative party of Canada ran an Ethical and clean campaign and uh, the reality .... the reality is, uh, that uh, we we are never Condone this kind of activity and frankly if anyone has engaged in it and that is proven they should face the full force of the Law." Suddenly, Dean Del Mastro ~ Con MP/Car-salesman suddenly wakes up from 9 month snooze and remembers rather vaguely that he too was a victim of dirty tricks. Shouldn't I be on that list? Bored On the Corner ~ Stephen Bryce~ Brilliant as always! 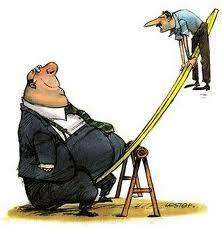 Have We ^NOT Reached a Tipping Point? 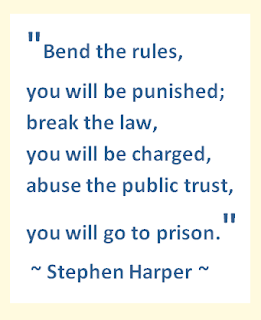 Please read on down the page for a more complete story on the Harper regime. Oh, Kim, you so rock..keep on the good fight. We are all in your corner, bud. 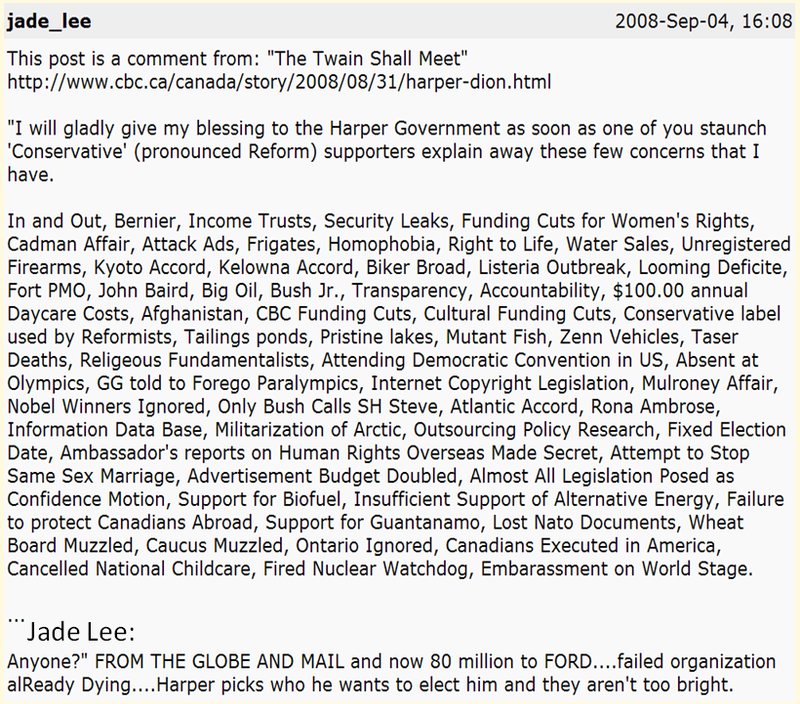 Love the"nine month snooze" re/Del Mastro. He's been dipping into the cookie jar one time too many! Just registering my acknowledgement that @VikiLeaks30 is a Twitter account. A personal thing, not a conspiracy. You don't even need to prove that Robo Con 2012 is a conspiracy, it is Far too big to be any thing else. But 91 Tweets at 140 characters is only 12740 Characters of what was already public information and a small personal project of a man who is pissed off about being called a Child pornographer. You all know that I get his angst! But it alone will not result in By elections! Please comment it gets pretty lonely here in Harper Land!